It’s been a chaotic two weeks in Rugby League land; there have been transfers aplenty, new signings making their debuts in the festive friendlies and much more – and League Express is back with the first edition of 2017 to keep fans completely up to date with the latest goings on in the game. Where next for Bradford? With a decision on the club’s future imminent, we speak exclusively to a man looking to take the club on in 2017 – if they are liquidated. Stand by for some scathing comments on the situation at the Bulls. There’s also reaction from Andrew Chalmers after his consortium’s bid was rejected last week, as he speaks exclusively to us. There’s another new face imminent at Leigh Centurions: find out who the Super League newcomers have agreed a deal to sign. 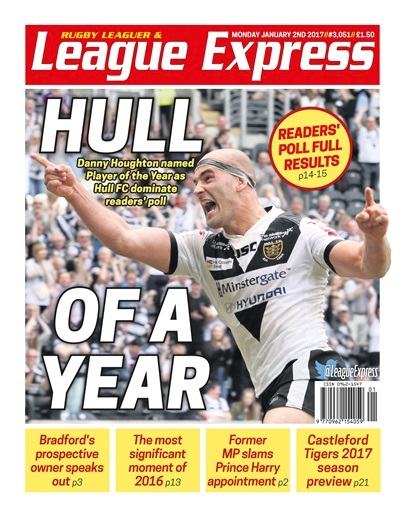 The results of our Readers’ Poll for 2017 are in – Hull FC fans; you may want to pick up a copy – and Garry Schofield tells us who he voted for. Meanwhile, which Championship player is being courted by a number of Super League clubs as a late recruit for 2017? St Helens coach Keiron Cunningham reveals which of his new signings he tried to get the club to sign five years ago! Meanwhile, Wakefield’s Tom Johnstone speaks exclusively to us about the pressure on his shoulders this year in an eye-opening interview. Prince Harry was named as the new patron of the RFL over the festive period – but we’ve had a damning verdict on the matter from a former MP – it’s a must-read!